Founded in Bologna in 1923, it was the reference company worldwide for carburetors assembled on racing and mass-produced vehicles. Since the 1980s, it gradually became part of Magneti Marelli’s industrial heritage, until its current form as Magneti Marelli Powertrain Division, at the forefront in powertrain technologies. Magneti Marelli has recently celebrated the 90th anniversary of the founding of the legendary Fabbrica Italiana Carburatori Weber, an industrial company famous throughout the world for its production of carburettors with high technological and quality levels, widely used by the world’s leading carmakers for mass-produced automobiles and by the best teams in motorsport for racing vehicles. The Weber company was founded in Bologna way back in 1923, and it gradually merged into Magneti Marelli starting from 1986. Weber’s experience and know-how laid the foundations for the development of technologies within Magneti Marelli, in the powertrain area, which have placed it today in the position of an important player at the global level in the production of systems and components for engines and transmissions of automobiles, motorcycles and light vehicles. A position that, along the path carved out by Weber’s history and tradition of innovation, aims at further improving the efficiency of heat engines and, at the same time, at developing alternative engine technologies (e.g. : hybrid-electric), both with a view to “sustainable mobility”. During these 90 years of activity, the most beautiful cars made by Ferrari, Maserati, Lancia, Alfa Romeo and Fiat, as well as by Aston Martin, Citroën, Chrysler, Cosworth, Ford, Lamborghini, Mercedes, Peugeot, Renault, Volkswagen and Volvo, have fitted carburetors, injection systems and robotized gearboxes made by Weber and Magneti Marelli Powertrain. And, as far as motorcycles are concerned, Ducati, Piaggio Group, Harley Davidson, Moto Guzzi, Moto Morini, MV Agusta and recently even the giant Hero MotoCorp Ltd, the world’s largest two-wheeler manufacturer. The Weber company was founded in Bologna in 1923 by Edoardo Weber, a young technician born in Turin from a Swiss father. The carburetor with vaporizer for trucks and the “Econo-Super-Alimentatore” (Economy-Super-Supply) were the first products made by Weber: clever solutions to the operational and regularity problems of the engines in those years. 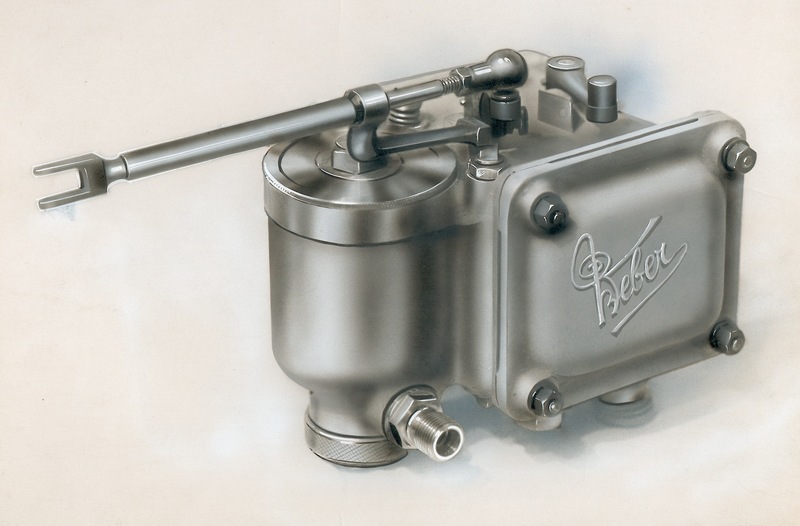 The launch of the innovative carburetor, known as the “box” carburetor due to its shape, led to the Company’s huge growth. This type of carburetor allowed vehicles to obtain performances otherwise unthinkable, with significantly lower consumption. The success obtained by the Weber “twin barrell” carburetors made it possible to strike up collaboration relationships with the most prestigious carmakers, which started to fit the Weber carburetors on both mass-produced automobiles and racing cars. This is the case, for example, of Alfa Romeo, whose Racing Department was headed by Enzo Ferrari, or of Maserati, with which a relationship based on friendship was established also at the personal level, up to the long-lasting and winning bond with Ferrari, from 1947 until the present. The plant located in Bologna, at the address of Via Del Timavo, was inaugurated in 1940. After various expansion and revamping jobs, the historical plant became a landmark for the city and, to this day, it is still the home of Magneti Marelli Powertrain. The time was thus ripe to cross the national borders: during the 1950s, Weber developed a solution for the DS19, flagship car of the French carmaker Citroën. It was then that the company started to expand into Western Europe, the United States, Brazil, Argentina, Eastern Europe, China and India. During the following decades, the extraordinary revolution of electronics in the automotive sector began to take shape at the horizon. In the 1980s, Weber and Magneti Marelli took part, together with Fiat, in the incorporation of Marelli Autronica, aimed at the testing and development of electronic components for the automotive market. With the establishment of the Engine Control division in 1987, Weber gradually merged into Magneti Marelli, becoming one of the very few industrial companies in the world capable of turning its longstanding experience in mechanics tied to carburettors into sophisticated skills in injection and engine control electronics. During this period, innovative solutions were also developed to transfer power in a faster and more efficient manner: the Formula 1 Ferrari of 1989 was fitted with the first Magneti Marelli-Weber robotized gearbox, which was an instant winner. During the 1990s, Magneti Marelli’s first robotized gearboxes made their debut on the Ferrari 355 F1 and on the Alfa Romeo 156; the technology featured by these gearboxes derived directly from the one introduced just a few years before in Formula 1. Magneti Marelli Powertrain was set up in 2001, incorporating Weber’s industrial assets. The racing-mass production technical osmosis pushed the technological evolution towards new frontiers in terms of efficiency, performances, safety, reduced consumption and emissions, and alternative engines. Today, in a sort of ideal continuity with what Weber started 90 years ago, the areas of said exchange can be found in the evolution of engine control electronics, in the AMT robotized gearbox, in the transfer of GDI from mass-production to racing vehicles, and in hybrid engines designed for sustainable mobility and based on KERS (Kinetic Energy Recovery System) technology, originally developed for Formula 1.Founded in Bologna in 1923, it was the reference company worldwide for carburetors assembled on racing and mass-produced vehicles. Since the 1980s, it gradually became part of Magneti Marelli’s industrial heritage, until its current form as Magneti Marelli Powertrain Division, at the forefront in powertrain technologies. Magneti Marelli Powertrain was set up in 2001, incorporating Weber’s industrial assets. The racing-mass production technical osmosis pushed the technological evolution towards new frontiers in terms of efficiency, performances, safety, reduced consumption and emissions, and alternative engines. Today, in a sort of ideal continuity with what Weber started 90 years ago, the areas of said exchange can be found in the evolution of engine control electronics, in the AMT robotized gearbox, in the transfer of GDI from mass-production to racing vehicles, and in hybrid engines designed for sustainable mobility and based on KERS (Kinetic Energy Recovery System) technology, originally developed for Formula 1. Magneti Marelli consolidates its presence in India.